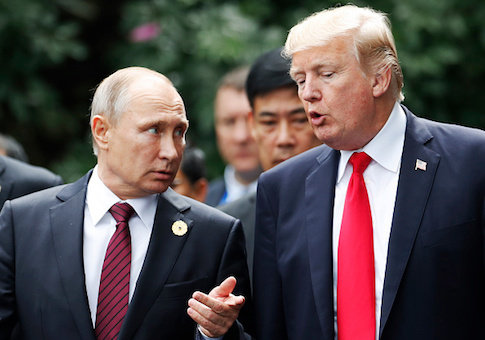 President Donald Trump called out Russian President Vladimir Putin for supporting Syrian dictator Bashar al-Assad Sunday after another apparent chemical weapons attack on Syrian civilians. Reports coming out of Eastern Ghouta indicate at least 70 people have been killed in the latest attack in the Damascus suburb of Douma. Russia and the Assad regime deny the accusations. Trump threatened in a pair of Sunday morning tweets repercussions for the attack and demanded that medical aid be able to go into the affected area immediately. "Many dead, including women and children, in mindless CHEMICAL attack in Syria," Trump tweeted. "Area of atrocity is in lockdown and encircled by Syrian Army, making it completely inaccessible to outside world." "President Putin, Russia and Iran are responsible for backing Animal Assad. Big price to pay," Trump tweeted. "Open area immediately for medical help and verification. Another humanitarian disaster for no reason whatsoever. SICK!" Trump ordered targeted missile strikes a year ago against a Syrian air base in response to an Assad regime chemical weapons attack. This entry was posted in National Security and tagged Bashar al-Assad, Chemical Weapons, President Trump, Russia, Syria, Twitter, Vladimir Putin. Bookmark the permalink.